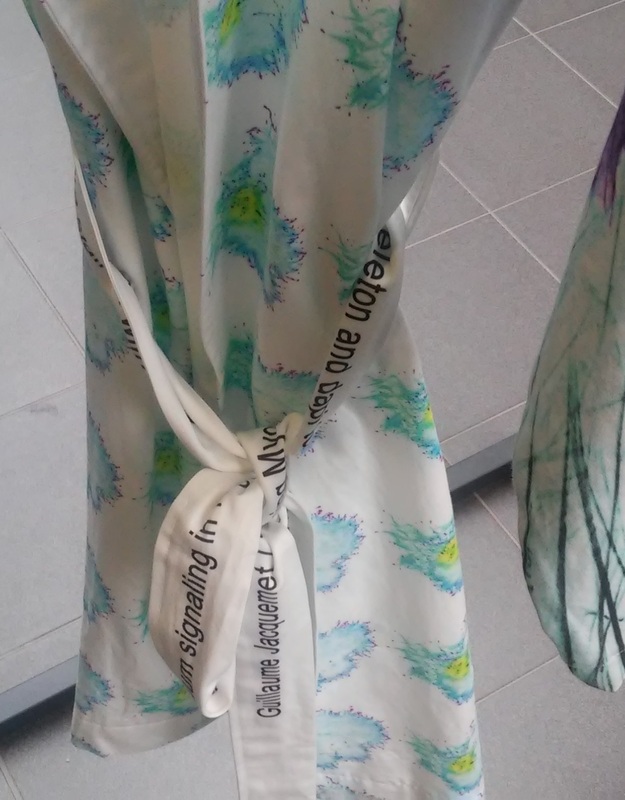 From Sade Kahra’s installation Wear Your Fear – Cancer Collection at BioCity Turku. Copyright Sade Kahra 2018. Photo: Fred Andersson. Visual studies belongs primarily to the ”humanistic disciplines” or ”the Arts”. To be active in Visual studies has often been a way to combine Art history with Comparative literature, Media or Film studies, Sociology, and even Linguistics and Psychology. However, the development of Image and Media technology takes place in the fields of Science, the fields of numbers and precise instruments. At least some knowledge of the natural sciences and of scientific methods is helpful if you want to understand the use and impact of images today. With our Visual studies intitiative at Åbo akademi, we try to break the comfort zone of our ”building” (Humanities and Languages) and to create dialogues with researchers from Computer Science, Psychology/Medicine, Bioscience and other natural sciences. One opportunity for such dialogues is our course Visuality and Visualization of Information (see Våra kurser / Our Courses). Our role as ”humanists” is of course not to try to become matematicians or biologists, but to understand (critically) how Science alters our ideas and capabilities. Not the least when it comes to our bodies. Here in Turku, we have a lot to learn from the Bioimaging program at BioCity Turku. Recently, on August 23rd – 24th, BioCity arranged the international symposium Seeing the Invisible. Many artists, working with ”fine arts”, take inspiration from biotechnology and bioimaging. Part of our job as scholars of ”liberal arts” (history, criticism, and the like) is to comment upon their work. Detail from Sade Kahra’s installation Wear Your Fear – Cancer Collection at BioCity Turku. Copyright Sade Kahra 2018. Photo: Fred Andersson. 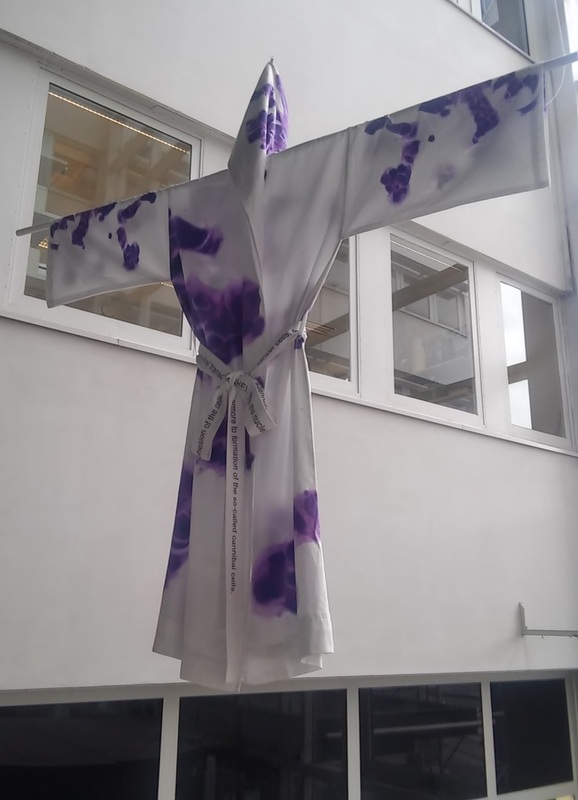 For the Seeing the Invisible symposium, Turku artist Sade Kahra had installed textile objects from her project Wear your Fear – Cancer Collection in the BioCity entrance hall. The objects are white robes on which colourful images of cancer cells have been printed. These images have been produced by scientists who work with the advanced microscopy and visualization devices available at the Bioimaging program. The robes are held together by ribbons on which some background information about each case/image is printed, the information being only partly visible. Most robes are hanging suspended around one of the main staircases of the hall. This exhibition is on view for a month, until September 28th. To print the images on cloth and to wear them on our bodies could be a way to reclaim the bodily and aesthetic experience in the abstract world of science: ”New technologies have formed medicine into an image science, but as in early physics, our internal microscopic elements are disconnected from all bodily and social contexts.” If this is so, then a more intimate relationship with Science and a deeper understanding of its images may help us identify more clearly the cultural habits and rules which usually condition how we see things. This is no doubt an important aim of Visual studies. Det här inlägget postades i BioCity Turku, bioimaging, bioimaging Turku, biomedicine, Okategoriserade, Visualisering, Visualization och har märkts med etiketterna bioimaging, medicine, perception, Sade Kahra, visualization. Bokmärk permalänken.